Double shock attack: Vivo, Bugz, out! hello poh.. im one of the top 100 cebu applicants..
ika #59 daw po ako..diko po alam ang intructions eh..
please tell me kung anong gagawin at saan ang venue? here lang poh reply&gt; Pretty9liesel@yahoo.com pls poh..
i reaLLy WaNNa c U in PerSon aNd i ReAlly Appreciate ur GolDen Voice TalgA… Jaz Wanna Let u Know na Maraming fans Ang Buong STARSTRUCK dito sa Amin sa Baroy, Lanao del Norte and My 2nd Home town Cagayan de oro city….. U’r really my inspiration Y sumali ako Sa audition ngbabaka sakali lng poh… Love u agen!!! ingatZZZ….more success in ur lYf!!! 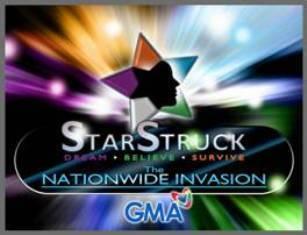 for arnel galvez,,he is the one who survive in dream believe survive……..startruck…..i would lyk to appretiate his very good talent……..lyk singing,dancing…..vote for arnel….ty…..
Pingback: Bakekang + Halukay TV » Blog Archive » Isabel Oli as ‘Bakekang’? Previous Previous post: Black Darna: Nadine or Katrina?